Fabricoupage, better known in South Africa as Serviette Decoupage, is the latest crafters rage to hit Europe, America and South Africa. This craft can be done on various of surfaces, fabric being perhaps the most common and certainly one of the most versatile surfaces used. By combining interesting fabric painting techniques, fabricoupage can be honed to a fine art form. So let your imagination run wild with all the different Dala Fabric Paint Mediums – from Liners and Puff Paints to Sun Colours, as well as stencils and edge patterns. Afterwards the whole cloth is sealed with Dala Waterproofing Medium to secure colour-fastness as well as strengthen the serviette. 59 x 86 cm Cotton, washed and ironed. Cut 2 pieces from that. Applique Paper (optional), available from art shops. Sponge Roller and Roller tray. 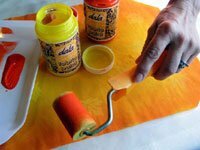 Dala Fabric Paint: Opaque White, Custard Yellow, Orange, Red, Green. Cut design out of decorative serviette. Design can also be torn out. Just paint water onto the line you want to tear and tear out carefully. Tear 2 layers off the back of the serviette. Paint a layer of Waterproofing Medium onto the fabric where you want to stick the serviette and place the serviette onto the Waterproofing Medium. 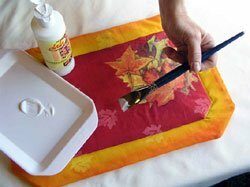 Flatten the serviette with decoupage roller. 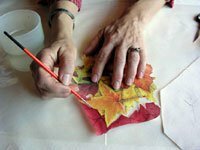 TIP: To ensure a wrinkle-free result, applique paper could be used. This way the serviette is stronger, more manageable to cut out and you prevent the serviette from stretching. However, the serviette and cloth must still be sealed with Waterproofing Medium. After you removed the back two layers off the serviette, cut applique paper, exactly the same size as the serviette. Now iron serviette onto the top of paper with a warm, dry iron, placing the rough ‘glue’ side against serviette. Cut out picture and pull off applique paper from the back of the serviette. Position serviette onto cloth and iron picture onto fabric. Draw a 5cm frame with pencil onto a 29,5cm x 43cm piece of fabric. Stamp sponge stamp, with White Opaque Paint, evenly spaced onto square and dry thoroughly. Tip: It works very well if the paint is placed onto a palette. Press a sponge applicator into the paint and onto the stamp. Press onto the fabric. This way, your print will show no brush strokes. If you want to use in conjunction with a serviette picture, follow the “To secure serviette onto fabric” steps. Place masking tape inside frame. Start painting right next to the serviette with a burgundy colour. (Mix red with a bit of green) Paint until right against the masking tape. Dry. Stick masking tape on the red, to leave frame open. Paint fame with Dala paint – mixing a custard colour by painting orange on the outside of the frame – half over the yellow. Rub the 2 colours together so that they blend into each other. Dry and remove the masking tape. Paint cloths, topside and lining, with one layer of Waterproofing Medium. Dry well. Pre-heat oven to 150° C. Bake on foil for 4 – 6 minutes. Warning: Don’t attempts to bake synthetic fabrics. They are likely to explode in the oven and you could get hurt. As an alternative: Iron back side of cloth with a dry iron for 3 minutes at a time on one spot. Stitch up with batting in the centre. - Soak in ‘soft’ soapy water for 15 minutes. - Merely wipe the cloth. - Rinse under the tap. - Dry flat and iron only the back side of the cloth. This item has 1365 views.